For the fifth time, Estonia's Police and Border Guard Board (PPA) is spending 24 hours, from 8 a.m. Friday through 8 a.m. Saturday, posting brief summaries of real emergency calls they are receiving to their official Facebook page in order to provide the public with a glimpse of what a typical day looks like for the country's law enforcement officers. According to the PPA, approximately 2,800 emergency calls are placed to Estonia's emergency number, 112, every 24 hours, of which nearly 400 require police response. Overviews of the emergency calls received during the 24-hour Facebook marathon will be posted with a delay and anonymized in order to ensure callers' privacy and avoid affecting possible investigations, the PPA noted in a press release. In addition to the emergency calls, police are also introducing and posting the stories of 24 PPA employees, one per hour — such as that of South Prefecture criminologist Alari Spaal, who likened his work to a Rubik's cube, saying that every day there was a new face and new incidents. "While my work constantly offers me something new and exciting, the best day is actually still when there is not one accident and not one crime is committed," Spaal added. According to PPA Web Constable Maarja Punak, who has been involved in every police Facebook marathon so far, the 24-hour event provides an opportunity for followers to sneak a behind-the-scenes look into the everyday lives of police, as well as get to know some of the individuals who have taken Estonia's internal security to heart. 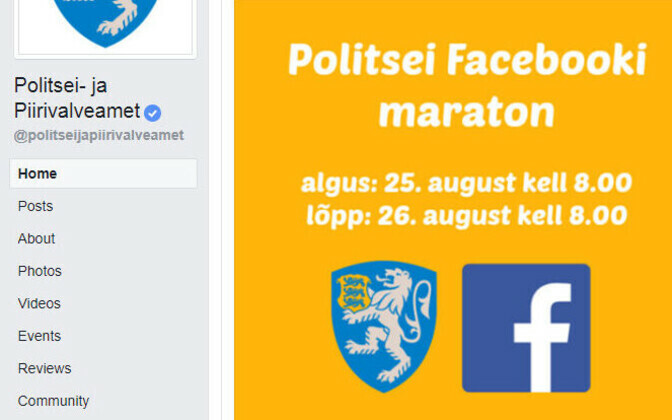 The Estonian police's last Facebook marathon took place on March 4, 2016, during which the PPA's Communication Bureau posted 650 times in 24 hours about actual emergency calls they had received. A word cloud generated later based on the content of these calls clearly highlighted the phrase "drunk man in Tallinn." This year, the first half of the social media marathon has likewise involved multiple recurring themes, many of which have been negative in nature, including incidents involving persons under the influence of drugs or alcohol, domestic violence, hit-and-run vehicular accidents and theft. In many cases, incidents involving the latter also involved alcohol and/or drugs. Others calls, however, have included more positive news, such as people reporting found passports, wallets and other items, as well as fender benders in which nobody was hurt and the incident would be taken to the drivers' insurance companies to be resolved. 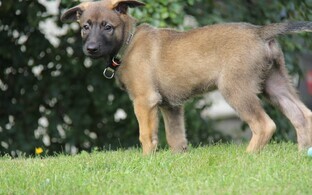 In more than one case, an individual who had been missing was found. Some calls thus far, however, have proven simply strange or even humorous. See below for a sampling of such posts from the first half of the Estonian police's 24-hour Facebook emergency call-posting marathon. FOUND ITEM: 8:45 a.m. A car has disappeared from where it was parked in a garage in Mustamäe on Wednesday. The police searched for the car in places where the caller had been during the previous day and found the vehicle in the store parking lot where the caller themselves had parked it yesterday. TRAFFIC INFO: 11:50 a.m. There is a brown cow walking in the road and alongide the road in Keila Municipality. FOUND ITEM: 1:43 p.m. A bike has been lying on the side of the road in Võru Municipality since Wednesday. Police contacted the owner of the bike, who was aware that their bike was lying on the side of the road. INFO: 1:48 p.m. A man was offered a cigarette in front of a store in Saaremaa. His head was now spinning, which is why he suspected that it may have in fact been cannabis. INFO: 3:58 p.m. The caller had lived with their friend in Raasiku Municipality. Today at noon, the friend's sister came and kicked the caller out. The caller could not get to their possessions anymore. INFO: 4:26 p.m. An older man is walking his sheepdog in Lasnamäe without a muzzle. The caller believes that this is dangerous. INFO: 4:50 p.m. The caller had contacted the police yesterday, believing they had been robbed by someone they knew. The caller is now letting the police know that they had found the money, which they had hidden at home themselves. TRAFFIC INFO: 5:12 p.m. The caller had run over a road sign in Viimsi and then gone on to drive home. They requested that police contact them. INFO: 5:39 p.m. The caller's neighbor in Central Tallinn is constantly causing them trouble. Today, the neighbor left water stains on their own windows and water is flowing onto the caller's window as well. The caller promised to come down to the police station and file a report. NOISE: 6:32 p.m. The caller in Narva is being bothered by loud noise and music coming from the street. The caller believes that people should sing indoors.